On Tuesday, November 29, 2016, Japanese developing company Cygames announced a new expansion for its hit collectible card game, Shadowverse. Titled “Rise of Bahamut“, this expansion draws inspiration from a previous Cygames mobile card game called Rage of Bahamut. While Shadowverse players knew about the upcoming expansion due to an exclusive interview TechRaptor staff had with Cygames, exact details on the expansion weren’t provided at the time. Our coverage of the previous spoilers from December 10 can be found here. 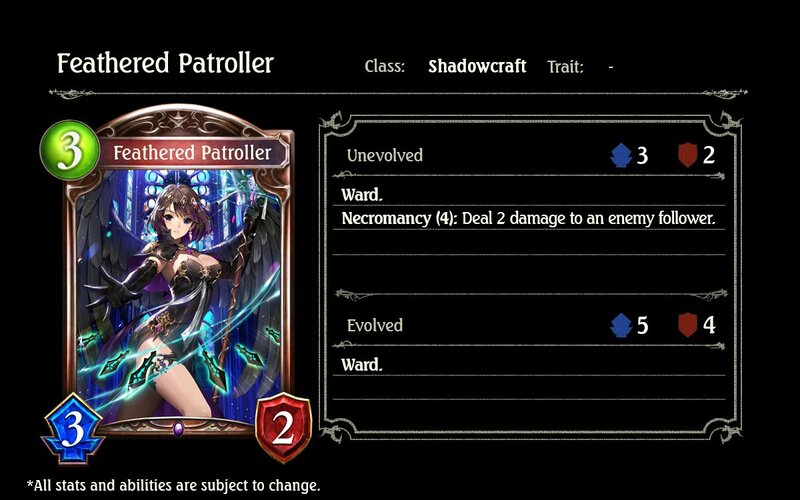 Last night, Tuesday, December 13, 2016, Cygames released information on nine new cards on their Shadowverse Twitter account; these cards were originally leaked on the Japanese website ASCII.jp, but the cards shown on Twitter are the first time players get to see the English. It’s important to note that the abilities and stats on the cards shown thus far aren’t set in stone and are subject to change the closer we get to release on December 29, 2016. 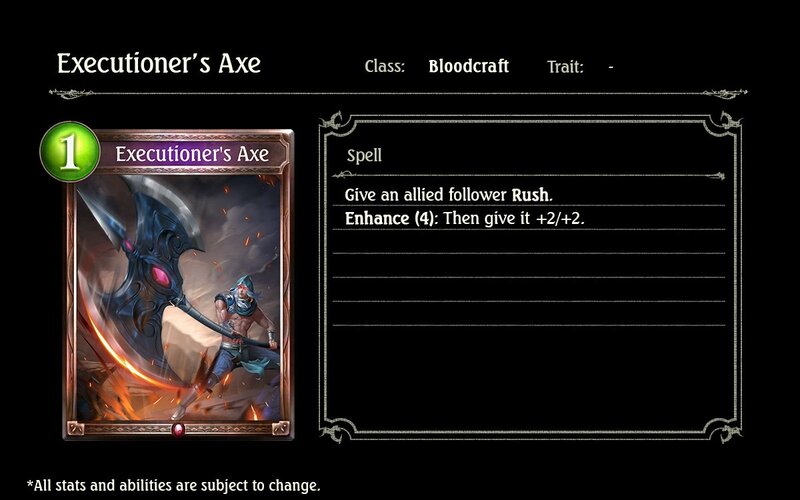 The first card revealed on Twitter is the Executioner’s Axe, a Bloodcraft-class Bronze rarity spell with a casting cost of one play point. This spell gives an allied follower the Rush ability, allowing them to attack enemy followers on the turn they were played, and also has the new Enhance ability, which activates when you have the specified number of play points or more; the card will instead cost that many play points to cast, and the ability will activate. Executioner’s Axe’s Enhance (4) will also give that follower +2/+2. 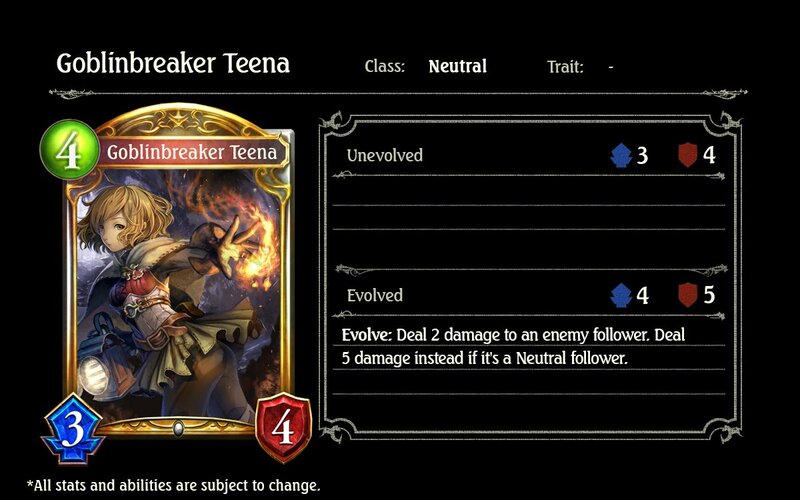 The Neutral-class card for the day is the Gold rarity Goblinbreaker Teena, a 3/4 follower which costs four play points to cast and can evolve into a 4/5 follower. Her unevolved form has no abilities, but when she evolves an Evolve ability triggers, dealing two damage to an enemy follower, five if that follower is of the Neutral-class. 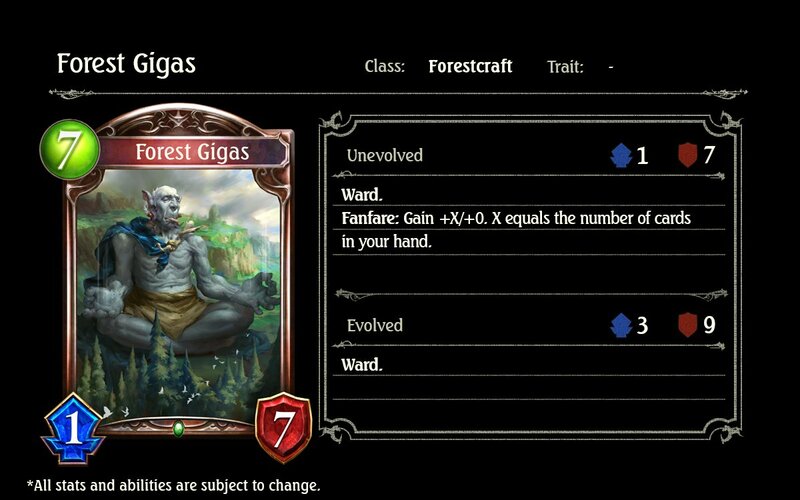 Forest Gigas is Forestcraft’s new addition to its pool of followers, requiring seven play points to put its 1/7 body into play, and bearing the potential to evolve into a 3/9 follower. This Bronze rarity card has two abilities; the first is Ward, which it has in both its unevolved and evolved forms. Until Forest Gigas is destroyed, enemy followers can only target him for attacks. This follower also has a Fanfare ability, which activates when it enters the area – for Forest Gigas, this gives him a +X/+0 buff, where X is the number of cards in your hand. 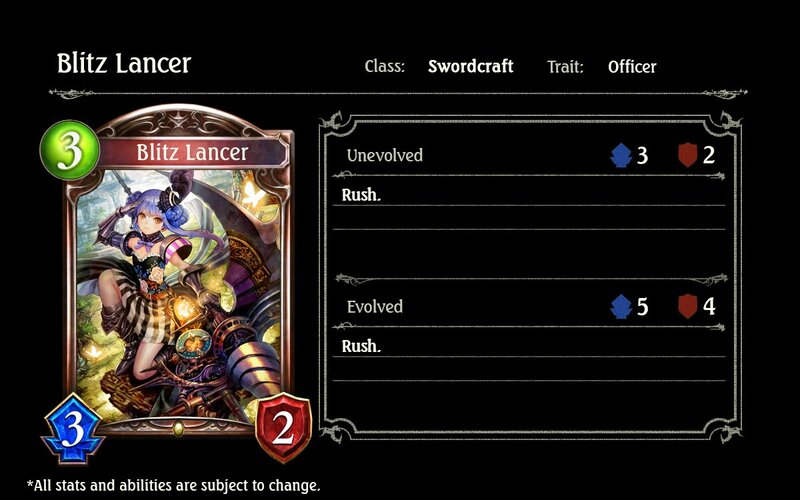 The fourth new Rise of Bahamut card is the Bronze rarity, Swordcraft-class, Officer-traited Blitz Lancer, a 3/2 follower which costs three play points to cast and can evolve into a 5/4 follower. Both her unevolved and evolved forms have the Rush ability. 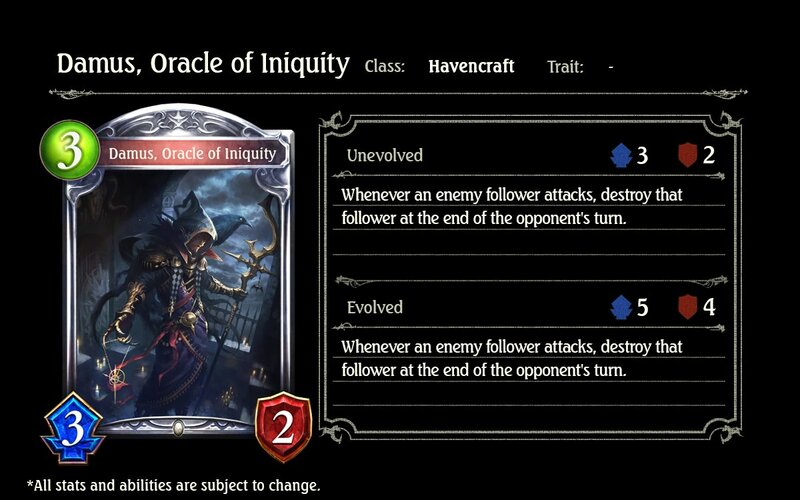 The first Silver rarity follower for the day is the Havencraft-class Damus, Oracle of Iniquity, a 3/2 follower with a casting cost of three play points that can evolve into a 5/4 follower. Both of his forms have the static ability that activates whenever an enemy follower attacks; at the end of the opponent’s turn, the enemy followers that attacked are destroyed. Up next is the Feathered Patroller, a Bronze rarity Shadowcraft-class 3/2 follower with a casting cost of three play points and the ability to evolve into a 5/4 follower. Both her unevolved and evolved forms have the Ward ability and her unevolved form has a Necromancy ability, which consumes the appropriate amount of shadows when it enters the area as the activation cost. For Feathered Patroller, her Necromancy (4) deals two damage to an enemy follower. 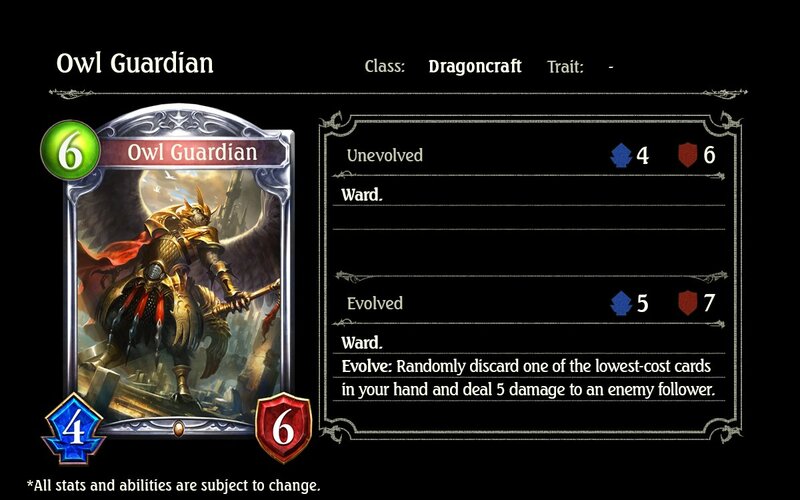 Owl Guardian is the Dragoncraft-class follower for the day, a 4/6 Silver rarity card that costs six play points and has the potential to evolve into a 5/7 follower. Both of its forms have the Ward ability, and it also has an Evolve trigger, which randomly discards one of the lowest-cost cards in your hand to deal five damage to an enemy follower. 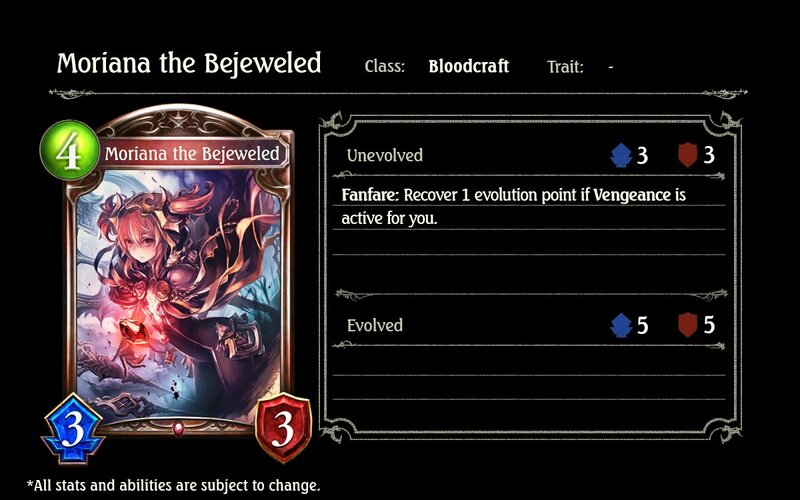 Unusually, Cygames revealed information on a second Bloodcraft-class card that wasn’t included in the leaks – Moriana the Bejeweled is a 3/3 follower which requires four play points to evolve and has the potential to evolve into a 5/5 follower. She has a Fanfare ability, which restores one evolution point to you if Vengeance is active (Vengeance is active if your leader is at ten or less health). 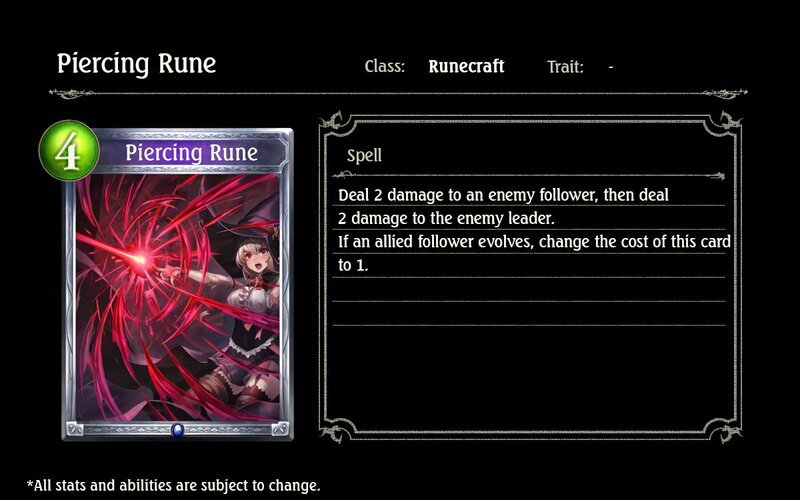 The final Rise of Bahamut spoiler card for the day is the Runecraft-class, Silver rarity spell Piercing Rune, which deals two damage to an enemy follower, and two damage to the opponent for four play points. However, if an allied follower evolves, the cost of Piercing Rune is changed to one play point. Shadowverse is currently available free-to-play on Steam, as well as on Google Play and the App Store, with some minor optional microtransactions that can be avoided without any noticeable impact on gameplay experience. If you’re interested in the competitive merit of some of the cards revealed thus far, TechRaptor’s newest writer Michael Xi has begun to take an in-depth look at how the newest cards play with the older expansions, and what fun new archetypes may exist in the coming meta environment- Part 1, Part 2, and Part 3 of his analyses have currently been posted. Stay tuned to TechRaptor for more information on Rise of Bahamut and all things Shadowverse. What are your thoughts on these Rise of Bahamut cards? Do you think they’ll see any constructed play? Let us know in the comment section below.